January 2018 – Page 2 – Let's Go RVing! 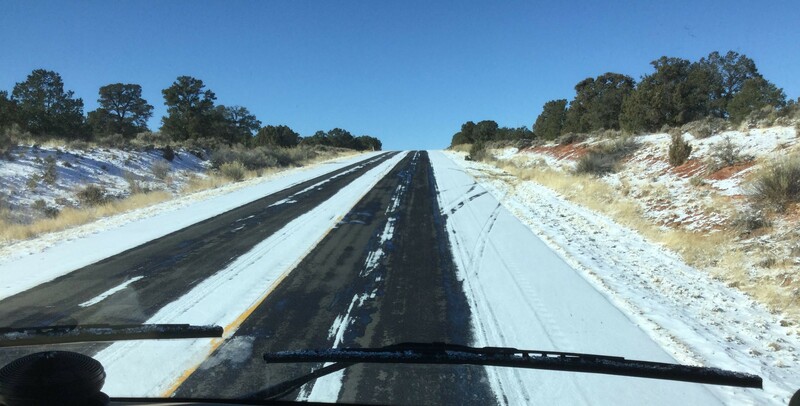 When I started thinking about planning a Southern Utah, Northern Arizona trip for January I posted a question about the feasibility of it on one of our RV message boards. There were several naysayers but one guy, Bill strongly encouraged me to go for it. He suggested many places to go and many things to see but cautioned me to be constantly aware of the weather. When we told people we were going I always added the caveat that we were going where the weather and wind allowed us to go. Yesterday I received an e-mail from Bill asking how things were going so I replied that all was well, we were having a grand time and I hadn’t seen one flake of snow. Oops – guess I need to update him. Last night just before bed Jerry exclaimed “Gale, did you know it was supposed to snow tonight?” Well no. 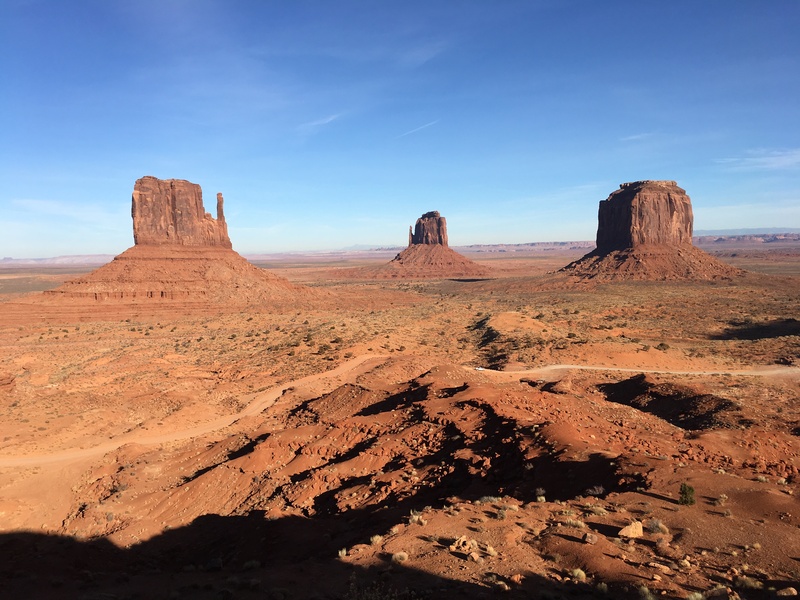 I had been checking the weather for both Monument Valley (Oljato-Monument Valley, Utah) and Page, Arizona and temps were too high to snow plus the forecast was not showing snow. Well, that changed! We woke up this morning to a snow covered ground. 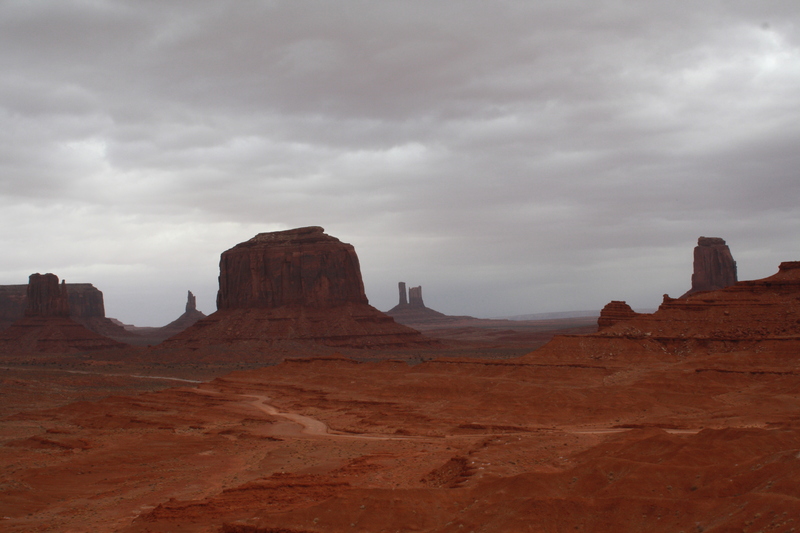 There wasn’t much but just enough to keep us in Monument Valley later than we anticipated. Also, Page appeared to get even more than Monument Valley and roads were not looking good at 7:00 am. Jerry checked everything out and felt that it was OK to leave so we pulled out separately a little after 9:00. The lanes in the campground were too sloped to hook the car up so he drove on down the partly icy road to the gas station and I followed slowly in the car. Hookup was done easily and quickly and we headed out at 9:23. The highway was fine but it was a little discouraging when we met a snow plow! At least it was going the other way! There was only one stretch that caused concern, at least concern for me. Jerry was listening to his audio book so I knew he felt good about it. For about 20 miles the only clear places on the highway were the car tracks. I just looked down, prayed and then read until suddenly everything was clear and there was no snow anywhere. Check in at Page Lake Powell Campground was accomplished easily but I was disappointed when they told me that Lower Antelope Trail was closed for two weeks – no reason why. We got set up quickly and then ate the picnic lunch we had prepared for yesterday. I had several things planned for the afternoon mostly centering around Glen Canyon National Recreational Area. 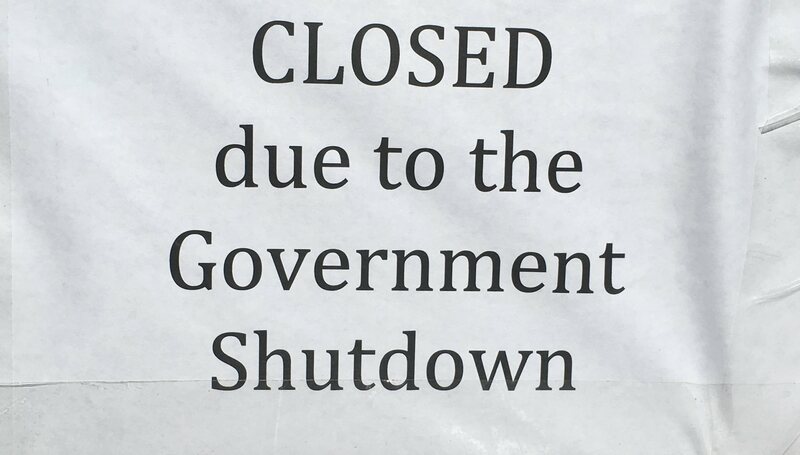 Imagine our disappointment when we realized that it was closed due to the government shutdown. Of course, we could enter the area and ride around and luckily we found a park newspaper but since no one was working there was no one to answer our questions or give us recommendations. 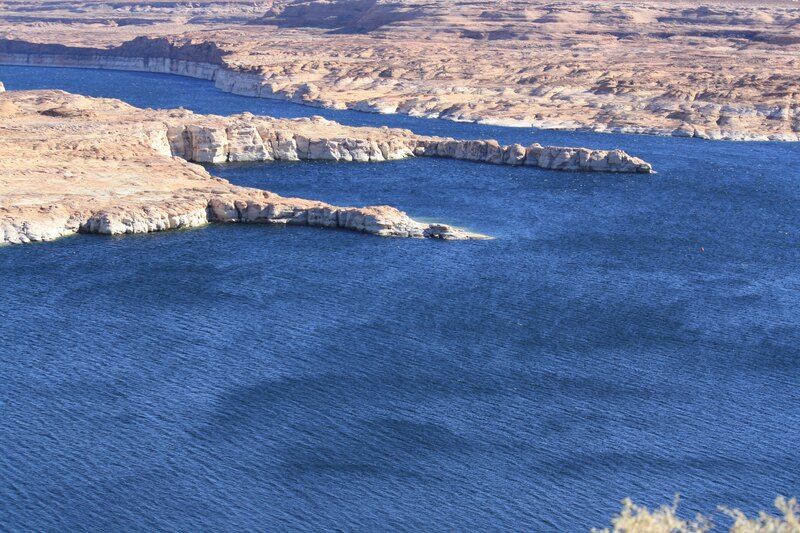 We did get a look at the incredible Glen Canyon Dam and then rode on to get stunning views of Lake Powell. Although it was cold and incredibly windy we stopped a couple of times to take some pictures. The lake, one of the largest man-make lakes in North America only covers 13% of the National Recreation Area and it is absolutely stunning. Of course there were no boats on the water but we saw many that were in dry dock and boy were they big! No idea if they were corporate or private or perhaps both but they were huge. In fact one two story pontoon had a circular slide to the water. We rode back into Page and just rode around the town where we saw poverty and a couple of blocks over beautiful homes right on the water, poverty and privilege only blocks apart. We wound around the corner where we saw church after church starting with a Baptist Church, a Church of God, a Methodist, a Lutheran, a Catholic and some others all side by side. After riding around for a while we stopped at the car wash and got perhaps the first layer of dirt on what used to be my red car. It was almost unrecognizable when we had arrived as the front up to the windshield was covered, yes covered in ice! I’ve never seen anything like it. Jerry had taken a hose and rinsed it off but it did little good so to the car wash we went. The motor home is in dire need of being washed too but that won’t happen anytime soon. Tomorrow we are hoping to hike Horseshoe Bend plus we are going on a tour of Upper Antelope Canyon. We had planned to be here four days but changed it to three and now in view of the shutdown continuing at least through tomorrow that may be too long. Unfortunately our next planned stop is another national park. Back to the campground and a lazy day of reading with popcorn and caffeine! 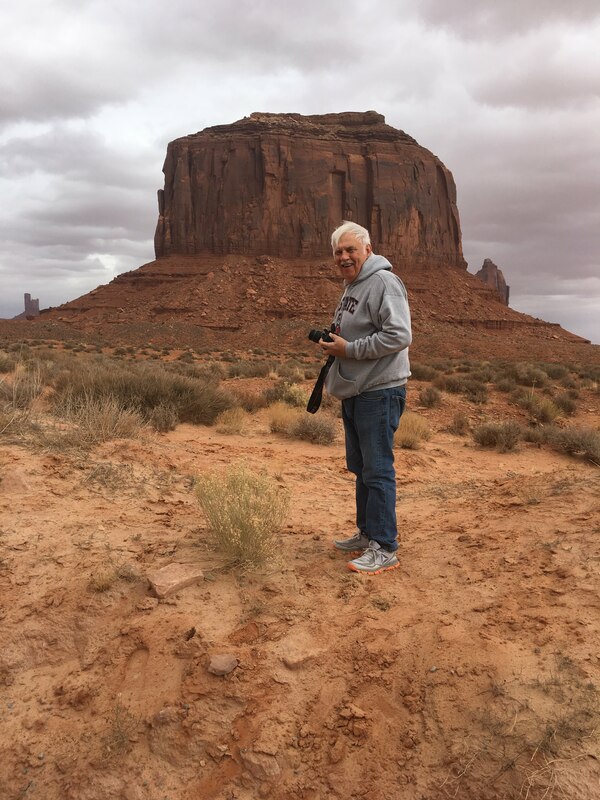 Although it was overcast and a bit dreary we headed to the Navajo Nation … to make the 17 mile loop drive through Monument Valley. I was a bit worried about the drive as I had heard that the roads were quite rough. We had the Jeep and its four wheel drive if necessary but … As it turned out the drive was OK. There were spots that were a bit rough but going slow was the answer. Speed limit signs of 15 MPH were posted but we never got over 9 MPH and most of the time we went only 3 or 4! Of course we stopped often as well so it took us nearly three hours to complete the drive. It was windy and dusty and although the thermometer stated that the temp was in the 40’s with the wind it felt much colder. 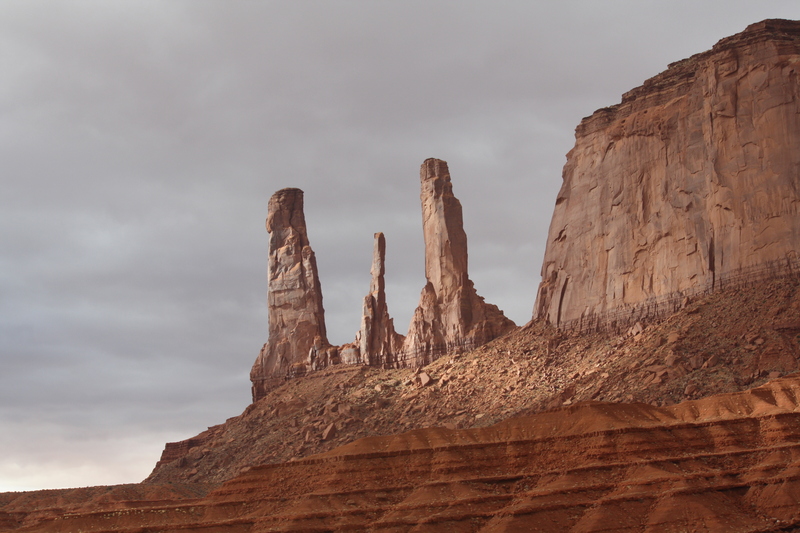 Our first magnificent view was of the mittens, the West Mitten Butte and the East Mitten Butte. My camera could not capture the beauty and my words can’t describe it. There they were in all of their splendor reigning over the vast valley like kings. What a sight to behold. As they protruded into the cloudy sky the enormity was almost overwhelming. Next we saw the Elephant Butte and it is just as you would imagine, a gigantic elephant facing the west of the desert. And then onto the Three Sisters, a Catholic nun facing her two pupils. Again the sheer beauty in the red rocks and the enormity were nearly overwhelming. As we stood there gazing at them the sun rays broke through the clouds and it was mesmerizing to watch the constant changes in the colors moment by moment. Our next stop was John Ford’s Point but since several tour buses had stopped ahead of us we decided to forego that and see it on our return. We continued on the road that had become more difficult to navigate and reached the Hub. The Hub symbolizes a hub of a wagon wheel and the Navajos see it as a fire place in the center of a gigantic Hogan. It was spectacular to say the least but when we got the binoculars out we saw it much clearer and there beside it were two Hogans! The center of the park is the Rain God Mesa where Navajo medicine men pray and give thanks to the Rain God who stored water for the people. We tried to take pictures but due to its enormous size and being so close to it we were unable to. The road continued to deteriorate but we soldiered on next seeing the Totem Pole in the distance. It is a spire monument, an example of what erosion does to a butte. 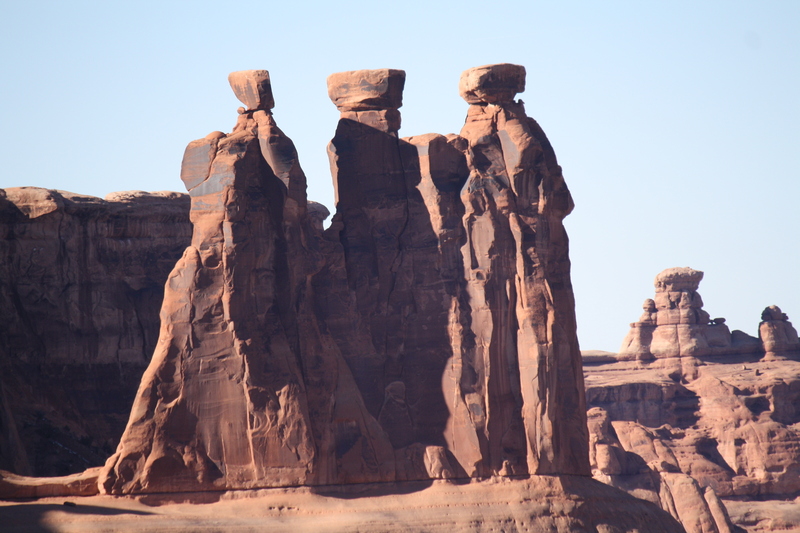 We know that erosion from a mesa causes a butte, erosion from a butte causes a spire but what happens to the spire? Do they disintegrate and fall to the ground? 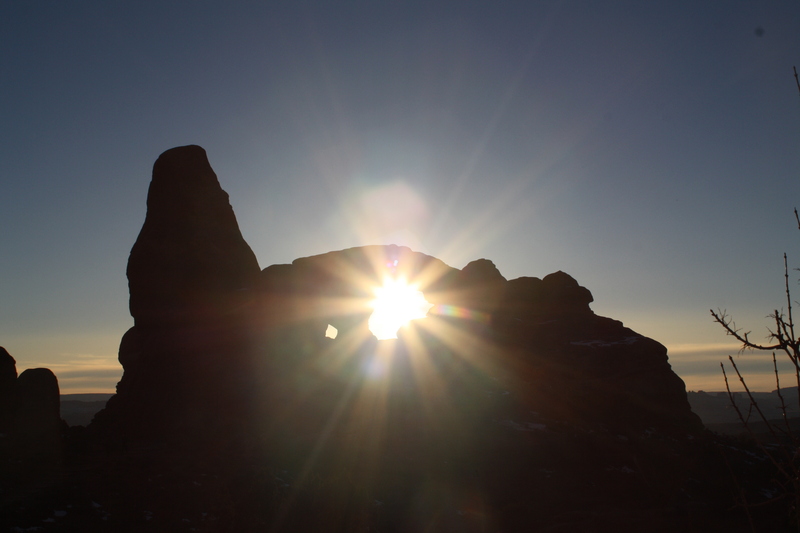 Were the many rocks we see lying around once spires? Continuing along the rocky, sometimes graveled road we reached Artist’s Point, described as a place where artists can create landscapes and bring them to life on canvas. Wow, is that true. What a panoramic view! A brief stop at the North Window and a look at the Thumb, a free standing butte apart from Camel Butte. It is described as looking like a cowboy boot but quite frankly I thought it looked like a gigantic thumb! On our way out we stopped again at John Ford’s Point where we got out and took a couple of pictures on the windy cold point. One more stop for some last pictures and we were on our way out of the magnificent Monument Valley. Although we had packed a lunch we decided on our way out to visit Keyanta, Arizona, 22 miles away for lunch at the Amigo’s, an authentic Mexican restaurant which had been recommended. When you pull into a parking lot and can hardly find a space to park you know the food is good especially when the locals are eating there. We had to wait a few minutes for a table as the small restaurant was completely full. I got a Green Chili Hamburger (the chili’s lived up to their name – it was hot) and Jerry got an Navajo burger on fry bread. It was enormous! I noticed that an order of fry bread was only $2.95 as opposed to the $5 we paid last night but we were too full to get any. We returned to the campground where we had a quiet afternoon and a chance to rest up from 19 days of traveling and touring. On to Page tomorrow for more exciting adventures! Oops! Was That a Rock? What an auspicious ending to our Moab visit. Last night as Jerry was listening to the NC State Wake. Forest basketball game with only 2 minutes left in a close game he suddenly exclaimed “Where is that water coming from?” Wow, there was a lot of water on the floor by the kitchen sink. He began to pull out things under the sink while I was trying with little success to mop up the prevailing water. He finally discovered that there was a loose fitting on the water line and the pipe was leaking not only when the water was turned on but also from the pressure buildup in the line. Praise God that I have a fixit husband who not only recognized the problem but resolved it as well. Unfortunately he didn’t get to hear the great win by State. Since we only had about 150 miles to go this morning to Monument Valley we didn’t rush but then… I was driving the car to the back of the RV for hookup and rather than go to the end of the park I decided to cut through one of empty sites. What a colossal wrong move. When I suddenly realized that I had driven over a BIG rock I put the car in reverse and made another colossal mistake. The car was stuck on the electric panel post at the site. Jerry didn’t even need to yell stop because I was stuck! He came over and Mr. Fixit again saved the day but it wasn’t easy. With several tools he finally got the door off of the panel and we were able to ease the car forward until we were unstuck. He tried to put the door by on but it was bent beyond repair so he stopped by the office to tell them what had happen offering to pay for repairs. The manager said it was no problem as he had several extra doors and to not worry and have a good day. Despite his good words I was still feeling nauseous due to my mistake. The check list then saved the rest of the morning. We have a checklist that we go through every time we move the coach and thank goodness for that. As I was going through I mentioned putting the shower head on the floor of the shower. Nope, Jerry had forgotten to do that so I ran to the back and put it down. It could fall off while traveling either damaging the shower head or possibly hitting the glass door. As I continued through the list I said “jacks up” and both of us looked at each other in amazement. We had not brought the jacks up. Gee, that would be a newbie mistake but our checklist saved us yet again. We finally pulled out a bit after 10:00 and began the trip to Monument Valley. We often gas up before we stop for the night but since gas stations that we could access were not plentiful on our way to Moab we didn’t stop for gas. Now we had a quarter of a tank and were wondering where to get gas. I checked and our usual stops – Flying J, Love’s and Pilot – were not even close but there was a ConocoPhillips in Monticello about 40 miles away. The question was could we get in it. Although the gas was pricey it was easily accessible and easy out both we know from the experience in Ganado very important to consider. Riding along the terrain really began to change and the temperature was rising as well, all to the way to the 40’s. We were definitely climbing mountains though with sometimes an 8% grade but our gas RV made it with no problem. Sure, we weren’t the fastest thing on the road but we made it. As we neared Monument Valley I saw that Open Range signs don’t just mean cattle as we saw several burros on the side of the road just looking at the cars passing by. We got to the campground around 1:20. When I went in to check in the attendant told me to go on into the campground and select a site and then let her know. We chose site 21 for no particular reason other than it is pretty close to a Wi-Fi antenna. We shouldn’t have any problem though because there are only two other coaches here. After lunch we decided to ride around and get the lay of the land. They are calling for rain tomorrow so we wanted to know exactly what to do and when so as to miss running around in the showers. We stopped at Goulding’s Gift Shop for a few minutes. They had some lovely things, pretty sandstone slabs and beautiful pottery. 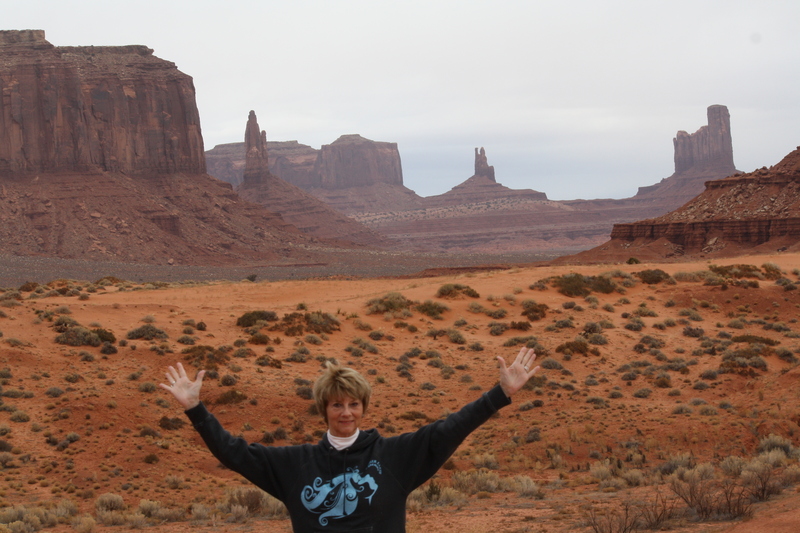 We continued on to the Monument Valley Navajo Tribal Park where we paid our $20 entrance fee good for four days. We stopped at the Visitor’s Center and wandered through the museum. That was so fascinating. One story that I found quite fascinating was about the Matriarch of Monument Valley, Susie Yazzie who passed away in 2013 at the approximate age of 93. She had lived a traditional Navajo life for nearly 100 years raising sheep, carding wool and weaving rugs all without benefit of of electricity or running water. Her mother died when Susie was very young and her father left in despair so Susie was left to raise her seven brothers and sisters. Her life took a turn when she married and her husband could work off of the reservation and bring home wagons, mattresses and other luxuries. The tourist business brought celebrity to Susie as she was in movies directed by John Ford. When she and her husband had trouble cashing their paycheck they had to go to Los Angeles which she referred to as the hot country. While there she got her Anglo name tattooed on her arm perhaps so she would know how to sign her name. As she didn’t understand English she was unable to understand the contracts presented to her so when a photographer got her to sign away the rights to pictures of her picture appeared on bags of Frito-Lays Sante Fe Ranch Chips! As the grandmother of seven I also found it interesting that the grandmother or “Shima Sani” is the most important person in every family on the Navajo Nation. From caring for grandchildren of working parents to teaching Navajo traditions she is the one who holds the family together, the one who is the decision maker in every family. We wondered around the museum some more and then walked outside to take some pictures of the beautiful view. Next we headed upstairs to the gift shop which was full of anything you might want, from t-shirts to elaborate pottery and jewelry. Jerry went in the restaurant and found that they served authentic Navajo food so we decided to go back later for dinner to sample the cuisine. After a stop at another Visitor’s Center we returned to the campground to wait for that delicious dinner that was coming up. And wow, what a dinner. We returned to the Navajo Nation Visitor’s Center and found it quite busy but then they probably had a captive audience as we saw only one other place to eat in the vicinity. Actually though the food was delicious. We first placed an order for fry bread. Little did we know that it would probably have been better as a dessert after dinner rather than an appetizer but it was delicious. It was served with honey (which makes everything better) and powdered sugar. Yummy! We decided to order the Navajo Sampler and were told that it was enough for two and indeed it was. It included Green Chile Stew (my favorite), Mutton Stew (Jerry liked it), Red Chili Posole with Pork and a small Navajo Taco and guess what – it came with fry bread. Jerry said it was all good but the fry bread was the best! Back to the coach and hopefully a good night’s sleep as we’ve got a full day tomorrow. Canyonlands, very different from Arches but just as beautiful with its canyons, mesas, buttes, fins arches and spires. As with Arches, nature has sculptured those beauties with water and gravity. We started our day with the Grand View Point hike. It was a stunning in and out trail with panoramic views going for miles and miles. The hike was only two miles, some up and some down. At the end of the trail we chatted with two ladies from Utah and were lucky enough to get a picture of the two of us. As I’ve said earlier we are complete failures when it comes to using a selfie stick! The trails at Arches were marked with large rocks but on this trail the markers where cairns or small rock piles. We could easily find the correct way to go. The view at the top was wonderful and well worth the walk. We stopped at the Buck Canyon Overlook but instead of using the picnic area we chose to have our lunch in the warmth of the car. I think Gertrude and Heathcliff followed us as they were right there as we ate. We also glimpsed a blue bird. Animal views at this point are two herds of deer, three or four deer in a cove, a roadrunner and a bunny outside our coach yesterday and today – not really impressive. Our next stop was the Upheaval Dome first overlook. This was a short but steep and rocky trail not clearly marked that led to a fairly clear view into Upheaval Dome. There was a further trail that led to a second overlook but we decided that we’d be seeing the same thing albeit it a different view so we clambered back down over the rocks and returned to the car. Our last trail was the Mesa Arch. It was another short trail, only a half mile round trip but wow! As we were walking along suddenly Jerry said there it is and oh my – a glorious arch in the gorgeous sun. What a view. Enough hiking today although shorter – we didn’t quite make it to four miles. A quick stop at City Market to pick up a few groceries and then on to the coach making preparations to leave for Monument Valley tomorrow. Another glorious day at Arches National Park. We had studied our map of the arches but wanted to verify our plans with the ranger so we stopped by the Visitor’s Center again. Since some of the trails were either closed or icy we wanted to make sure we were making safe choices. 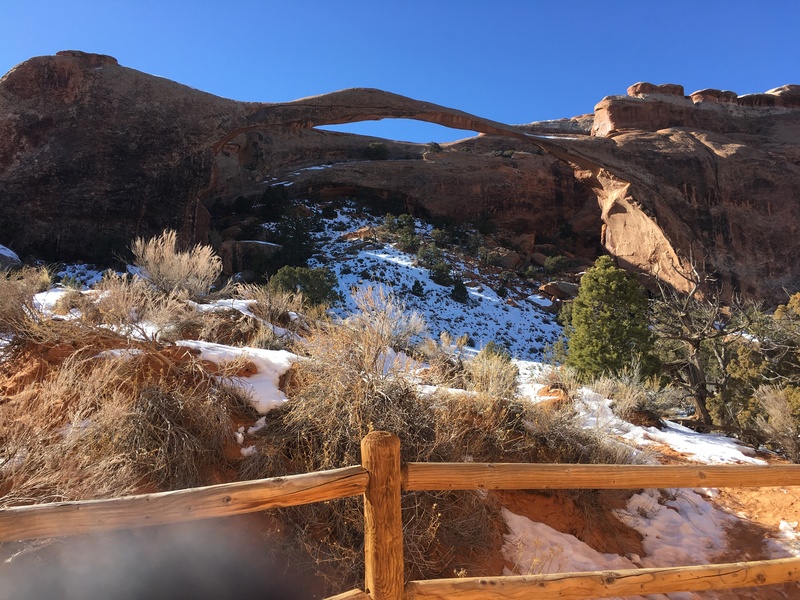 The two trails we were interested in hiking were Landscape Arch and Delicate Arch. The ranger told us that the Landscape trail was pretty icy and suggested we buy the $12 cleats in the bookstore. There were only two pair left so we bought them with the promise that we could return them if we didn’t use them. We watched the video again just to get more familiar with the beautiful arches silhouetted against the horizon everywhere we looked. 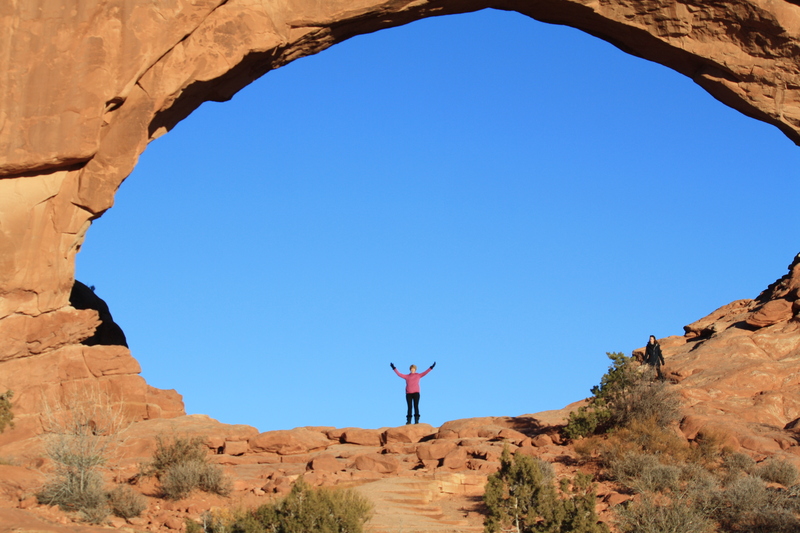 Arches National Park has the greatest concentration of natural arches on the earth. An interesting contrast mentioned in the video was that arches built by man are the purposeful product of construction while in nature the arches are the product of destruction. The very processes that create the arches also destroy them. The landscape is ever changing and we know that the arches we see today may well be gone in a few years as they tumble to the earth and more are formed. 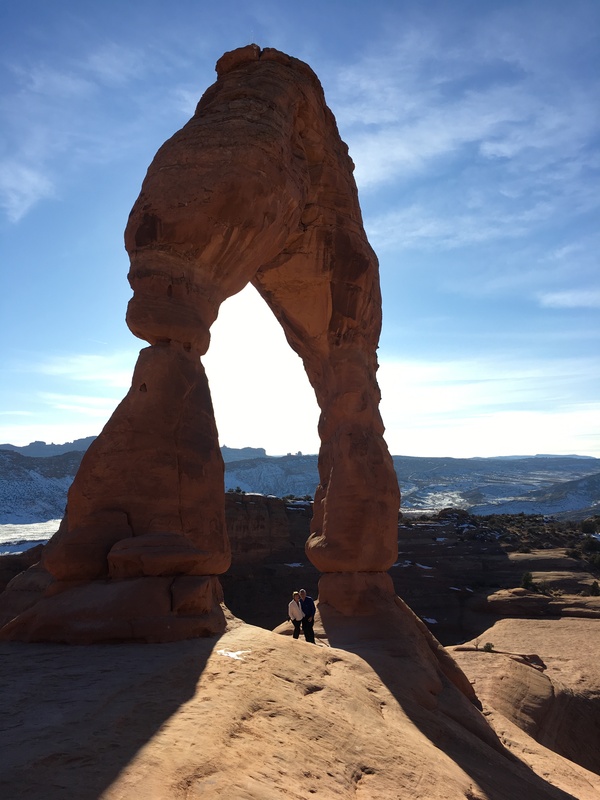 After the Visitor’s Center we headed all the way to the top to Devil’s Garden where the Landscape Arch was located. It is marked as an easy trail 1.6 miles round trip with a relatively flat, hard-packed trail. It would have been an easy hike were it not for the ice and there was definitely ice. We didn’t put the cleats on our shoes initially but after I slipped twice I found a rock to sit on and Jerry help me put them on. They just fit around the shoes and are fairly easy to put on. Once we realized that we could keep them more secure if we tied our shoelaces through them we had no problem. It was just a few minutes later when Jerry decided it would be wise to put his on. What a difference they made. We easily walked through the ice with no slipping and sliding and no fear of falling. It was a pretty cold hike as the wind was blowing a bit. I ended up putting my earmuffs on and then my scarf over my head. BUT – it was worth it. When we saw the Landscape Arch we were absolutely amazed. As with all of the arches that we have seen it defies description but it was stunning. After the hike we sat in the car and had our picnic lunch and then headed for the 3 mile round trip hike to Delicate Arch. The hike description says “some exposure to heights”. Well yeah! The entire trip is uphill and it is described as difficult. It wasn’t really hard but it was arduous and exhausting. Just before we reached the top we ran into a lot of icy path and it was treacherous to say the least. Jerry said he was proud of me because of my fear of heights but I never noticed the height as I kept my eyes on where I was walking. Some folks from Taiwan were walking nearby and they were very helpful as we all walked the treacherous path plus they took some pictures for us. And then…we rounded the corner and there in all of its splendor was the Delicate Arch. Oh my, what a spectacular sight to behold. We very careful traversed the area and made it down to the arch itself where we had our picture taken. You can hardly see us though because the arch is so large. It was a difficult hike but so worth every minute of it. The return trip was much easier as it was all downhill although steep. It took us about an hour to go down and the parking lot was a welcomed sight. After the hikes we went to City Market Pharmacy to pick up a prescription for Jerry and then to the Grill for a very mediocre dinner. We were back at the coach by 6:30 exhausted but exhilarated and ready for Canyonlands tomorrow! We woke up this morning to 16 degrees with a real feel of 9 degrees and Jerry had to unhook everything plus we had to hook the car up! At 7:00 it showed no signs of warming soon. We got everything done inside and then went out to get the car hooked up. Of course the windshield on the car was frosted again so with my head out of the window I drove the short way to the back of the RV. It wasn’t so bad and we were on the road by 8:40. About 15 minutes later we stopped to fill the propane tank which we knew was low. I had read that most RV propane tanks last about five days in cold weather and we had used ours four. As Jerry drove along I searched for a campground for the night. I had called and left a message yesterday with a Passport RV park but had not heard from them so I continued my search. I called Spanish Trails RV and they had space so I made the reservation for three nights. As soon as we got checked in and got some lunch we headed to the Visitor’s Center in Moab. We got a lot of information and a lot of good tips. 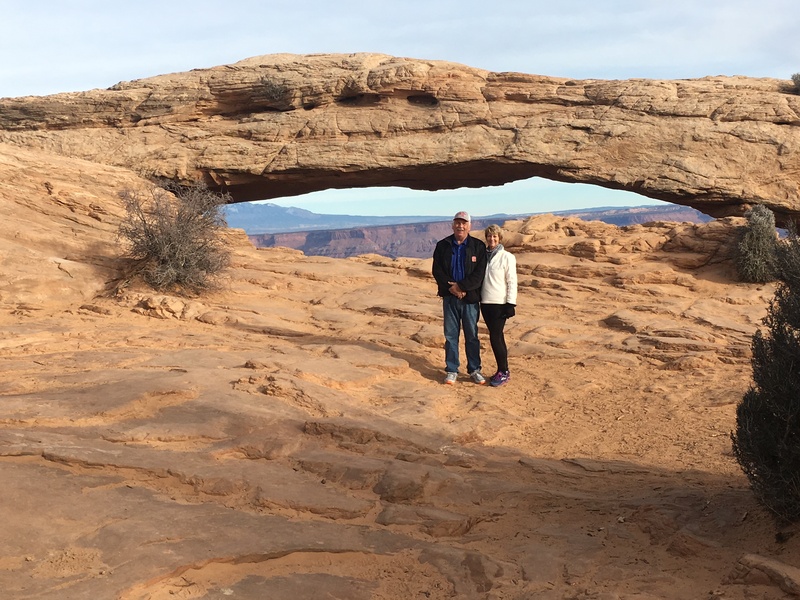 We then headed to Arches National Park where we watched an informative video, talked with a ranger and got recommendations on what to do with our afternoon. Some of the trails were closed due to ice so we decided just to drive the park and stop when we wanted to. Our first look at the majestic view was absolutely overwhelming. The beauty, the majesty, the ruggedness defy description but suffice it to say it was breathtaking. The park has over 2000 arches and they are easily visible. Interestingly enough the arches have a life cycle just like humans do. They are ever changing even from day to day. Rain, snow, cold, and heat all play a role in the life span of an arch. We began with the winding road going up and first stopped at the Courthouse Towers Viewpoint. From there you could see the Three Gossips, the Sheep Rock, the Tower of Babel and the Organ very clearly. We continued on to the Balanced Rock which was amazing. We got to walk all around it and even clamber over some of the rocks. There was a path going around and the signs instructed tourists to please stay on the path as going off could cause extensive damage to the vegetation and cryptobiotic crust. Another way to say “Leave no trace”. The ranger had suggested that we might want to be at the Windows Section at 4:30 when the sun began to set so we bypassed that turnoff and continued on the road up. 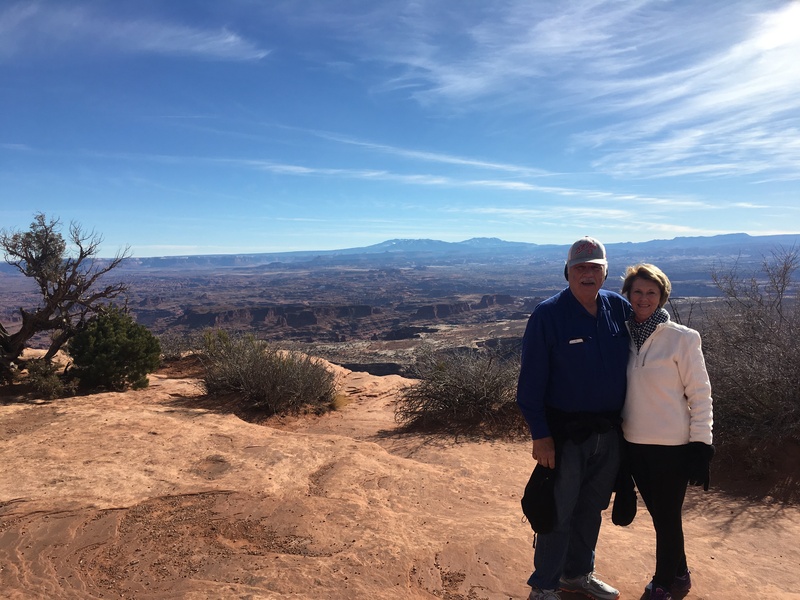 Our next stop was the Viewpoint for the Upper Delicate Arch and the Lower Delicate Arch. The path to the Lower Delicate Arch view was very short and there in the distance was the beautiful arch. The path to the Upper Delicate Arch view was a bit longer, a half mile of moderately strenuous trail and part of it muddy and icy. Someone had placed rocks along the muddy parts for walking across but that person certainly had longer legs than I. At one point they had placed a log to walk on. Jerry circumvented it but I walked across both ways without falling in the mud! The hike was surely worth it and the arch was stunning. We continued up to the Skyline Arch which again was stunning. We walked up as far as the path allowed and got some pretty pictures. 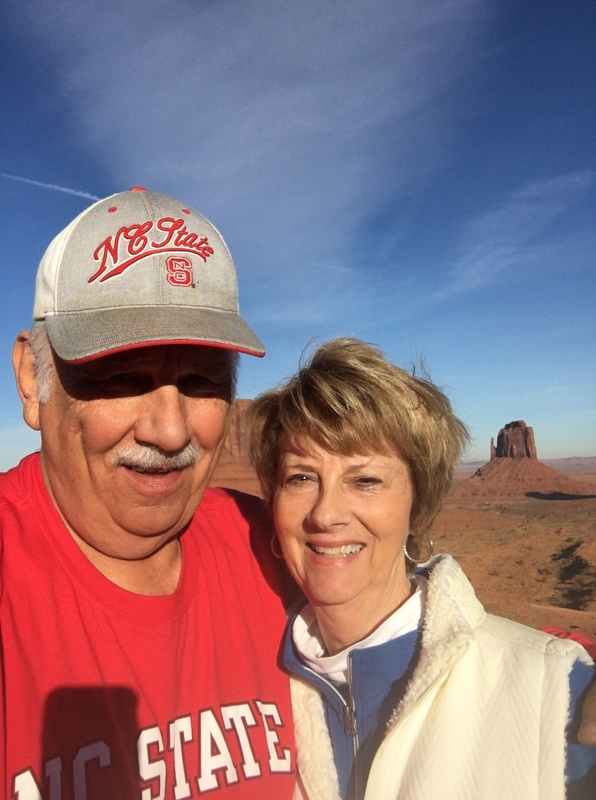 We rode on up to the Devils Garden Trailhead but knew immediately that it was beyond our capability – 7 ½ miles! On the way down we stopped at the view point for the Fiery Furnace. The red rocks reflecting in the sun were mesmerizing. We heard some others trying an echo so as we left Jerry yelled “Wolfpack” and we heard it faintly echoing over the rocks. We quickly headed to the Windows to see the sunset. Apparently everyone had the same idea as there were lots of people there and some serious photographers. Many had tripods and were quickly going to their favorite spot to get the best shot. We walked around quite a bit with Jerry trying to find the perfect spot to catch a shot of the sunset through one of the arches. A difficult task surely but I think he got some nice shots. Afterward we went by the City Market, got some groceries and headed to the house! A day of history and mystery! Our last day in Cortez, Colorado was jammed pack starting with a visit to Hovenweep National Monument which we thought was in Colorado. Although the address is Cortez it is actually located in Utah. The website stated that we should not follow a GPS so we just took off in the direction we thought we should go and by golly, we were right – I think. About four miles out of Cortez we turned on a winding, sometimes icy county road where we saw cattle and horses on the side of the road. In North Carolina we use fences! 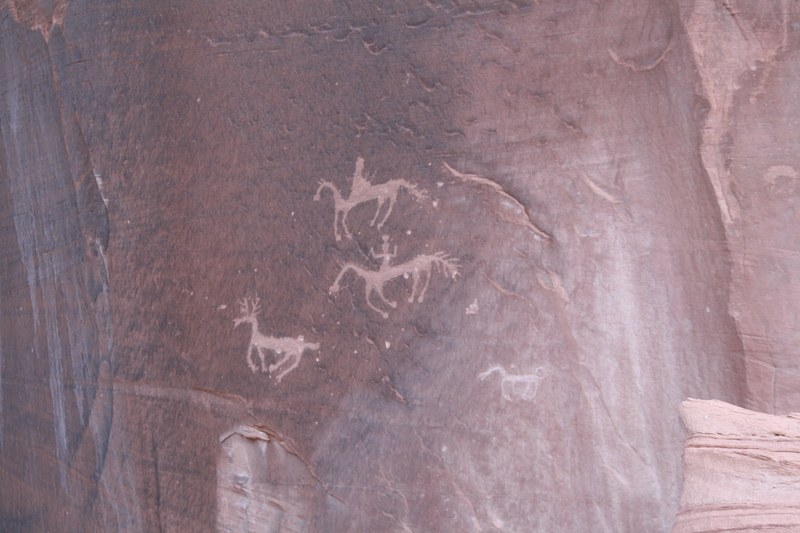 We later learned that the horses belonged to the member of the Navajo tribe. Actually part of Hovenweep is located on the reservation. We enjoyed riding through the country and seeing a part of Colorado (and apparently Utah) that we had not seen before. It really is quite lovely. 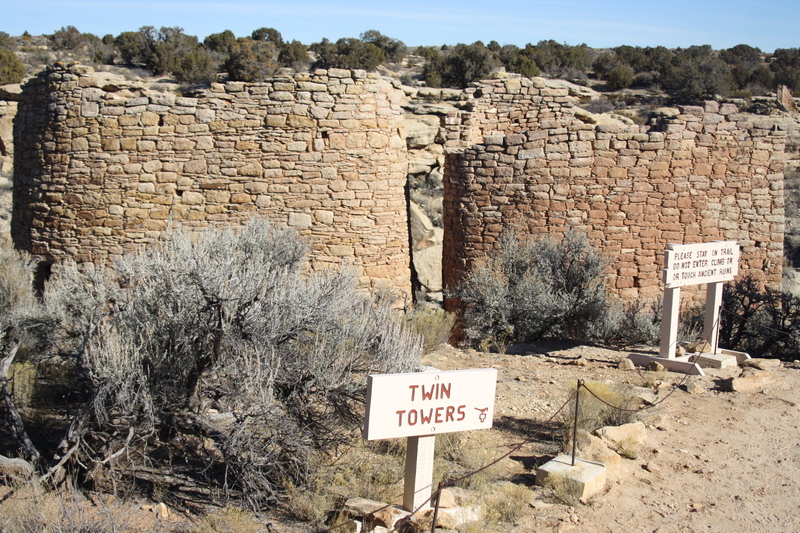 Hovenweep is a Paiute and Ute word meaning deserted valley. The people who lived there were members of a larger ancestral Puebloan culture occupying the area from about 500 A.D. to 1300 A.D. They were farmers who established trails and roads between the communities. 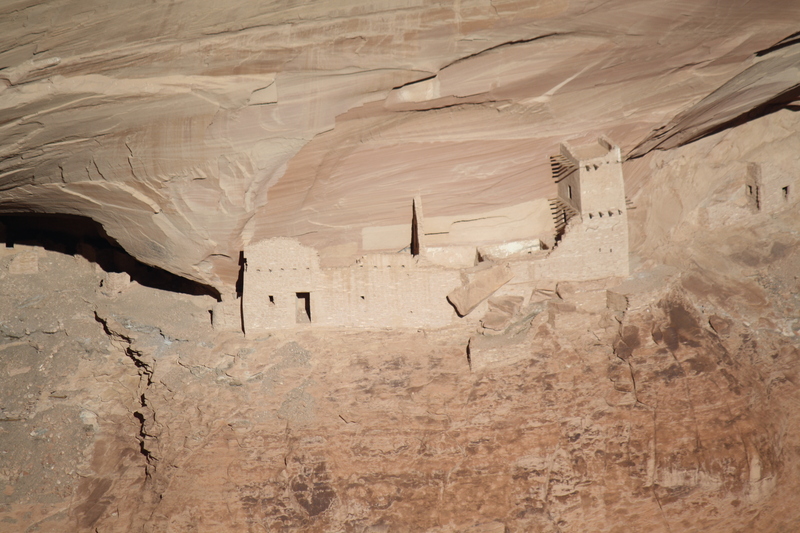 They also erected elaborate cliff dwellings, multi storied pueblos and outstanding towers. After watching an 18 minute video on the history of the people we took off on a 2 mile plus hike around the ruins. We actually went in the back way and not knowing it saved the most difficult part until the last. Most of the hike was either on paved walkways or dirt with no obstacles to avoid. It is an amazing look at the lives of the people and the fact that the buildings are still standing are testament to their stability. What happened to the people remains a mystery today as no one can say where or when they left the area. Knowing we were running out of time we had our picnic lunch in the car as we returned to Cortez by a very different route, an easier route I think. We just followed the signs! 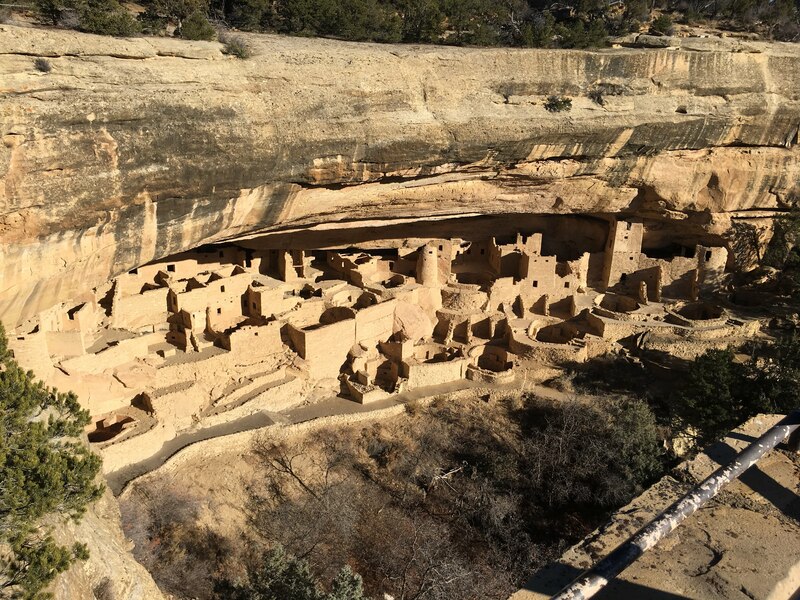 We went directly to Mesa Verde National Park and up the 20 miles we went. We started on the trail for the Spruce Tree House knowing that we could only go so far as it was closed for the winter. 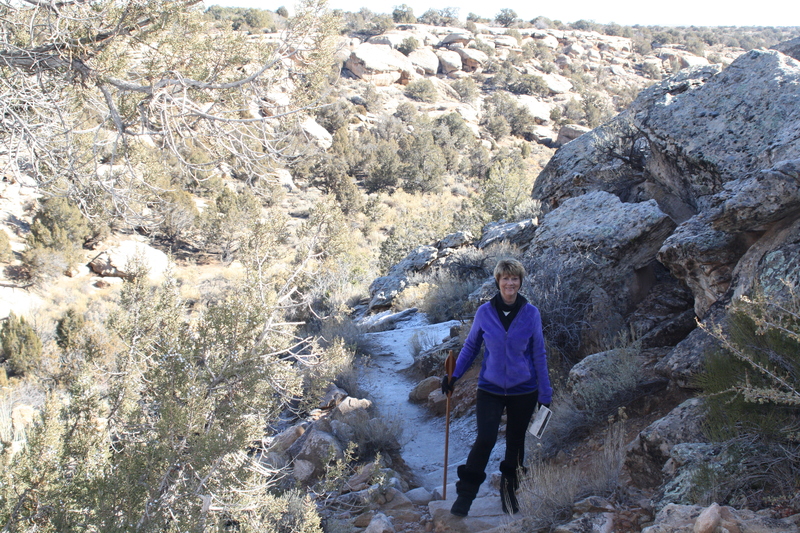 We ventured on down to the Petroglyph Trail which was an extremely steep paved trail. We had not gone very far when we decided to return to the museum. On the way out we stopped at the Far View Sites Complex which includes Far View House plus four other villages and a reservoir. We were able to get up close to the structures and then were actually able to wander through the structures at Coyote Village. Constructed before 975 A.D. Coyote Village as built, occupied, abandoned, rebuilt, and reoccupied several times. It was awesome to walk through the ruins knowing that people once lived, laughed, cried, worked, and, loved there many years ago. We woke up to 19 degrees outside this morning but our propane heat had kept us warm through the night. The house battery was down but not dead and when we turned the generator on it began to recharge. We had hot water and all was well. We had survived two cold nights with no hookups! As Jerry said, it’s a different mindset when you are without hookups and there’s a lot to consider. Will we do it again? We’ll see. Because of the angle of the RV and the car we could not hook up last night so had to do that this morning. Of course breakdown was easy and quick. Jerry pulled out with the coach and I was to follow him in the car to level ground. There was just one problem and one we are unaccustomed to because at home we keep our cars in the garage. Well, last night there was a heavy frost and my windshield was covered in ice and of course we didn’t even have an ice scraper! Oh well, with my head out of the window I slowly navigated the campground and pulled up to a laughing husband who had finally figured out why I was going so slowly. We were on the road a little after 8:00 and on the way to Tec Nos Pos where we would visit the Four Corners National Monument. Acting foolish in four states! Located on the Navajo reservation the actual four corners are located in the center of the square and surrounded by Navajo venders selling mostly jewelry. 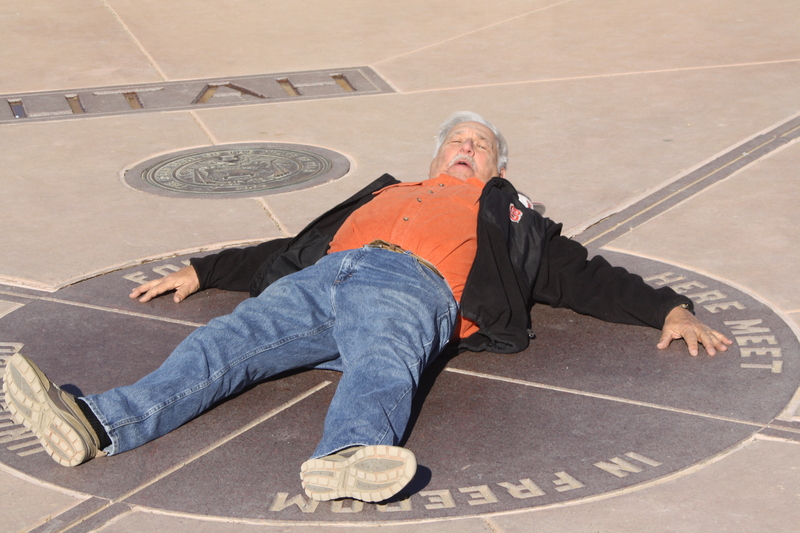 After perusing all of the vendors we had fun taking pictures of each other on the four corners. Although there is a limit of three pictures per person because there were so few people there we were able to get a few more which were accompanied by a lot of laughter from us as well as others. Hey, we didn’t know anyone so we didn’t mind acting a little crazy. Now we can both say we have been in Arizona, New Mexico, Utah and Colorado at the very same time. We were only there about 30 minutes and then on to Cortez, Colorado and La Mesa RV Park. We had no problem locating the park and following directions received when I made the reservations we pulled into our site, #32 and got set up fairly quickly. It is so nice to put the jacks down and NOT get an excess slope message. A level site and full hookups plus WiFi – wow, looking forward to this, plus it’s a Passport park so we get our site for half of the normal price. After a quick lunch we headed toward Mesa Verde National Park but before we could even get there we were absolutely mesmerized by the snow topped La Plata Mountains in the distance. Jerry pulled off of the road and got some pictures which I am sure will find their way to a computer background. We stopped at the Visitor’s Center and asked for recommendations for a short afternoon. Since it was nearly 2:00 they recommended riding the 20 miles up to the museum. It is a lovely ride with overlooks periodically. The first one we stopped at had a lot of snow but it didn’t create a problem when walking. There were icy patches on the road but again they created no problem. Jerry drove slowly and carefully realizing it again was a long way down. At one point we reached an elevation of over 8,000 feet which for us flatlanders (43 feet above sea level at home) was mighty high in the sky! Before stopping at the museum we rode to the Cliff Palace overlook. Oh my goodness. My jaw just dropped when I saw the ruins below. How I would love to wander around them but alas, it’s winter and there are no tours. We continued to other overlooks and then to the museum. We talked with a ranger there who suggested other sights we might want to visit. That’s when our plans began to change. We had only planned to spend one night in Cortez but as Jerry said there is so much to see here and we will probably never be back again so … we are staying an extra night. Because a morning hike might be icy we decided to visit Hovenweep in the morning and then return to Mesa Verde by lunch. I can’t wait to see everything! It feels good to know we’ve got electricity and water tonight! 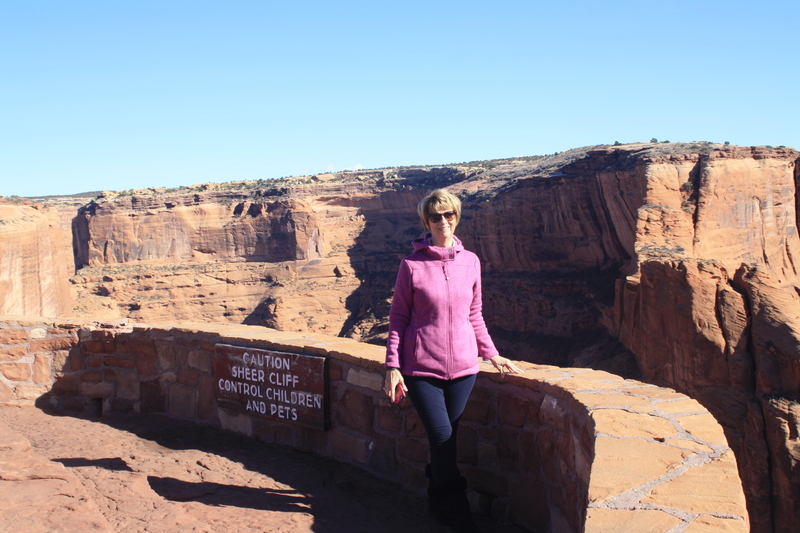 Our Arizona Jeep Tours guide picked us up just before 9:00 for a canyon tour of Canyon de Chelly. Our first stop was to get the permits for us to enter the Canyon de Chelly as tourists are not allowed in without a guide and a permit. Our next stop in the next parking lot was to meet with the owner and pay the fee. Although he had quoted us $70 yesterday he charged us $75 each today. Oh well, everybody has to make a living. Our guide’s name was Terrill Spencer and he gave us a lot of history and background on the canyon. There is no way that I could describe each stop that we made but each one was unique. Although several had ancestral homes we could view from a distance they all were different in their own special way. From a distance though they looked like miniature doll houses. The canyon walls are so very steep that by the end of the trip I nearly had a crink in my neck from constantly looking up. The colors were varied and determined somewhat by the runoff of the different minerals from the top. The road was bumpy and muddy and at times I worried that we might get stuck but Terrill kept it going. We were in an older Suburban with Jerry in the front seat and me in the back and trust me, it was a bumpy road. After we had been riding and stopping for about an hour Terrill got a phone call saying he needed to return to the office to exchange vehicles as someone needed the Suburban so he asked if we were in a hurry. What could we say so we turned around and headed back. Just as we were reaching the office he got a message saying that it wasn’t necessary so we turned around and resumed our tour. Our 3 hour tour turned into a 4 ½ tour! One of the highlights of the tour was stopping at the White House ruins. We could get out of the car and actually walk pretty close to them. We had planned to hike there in the afternoon but after seeing them we decided against that. They were, to put it simply incredible! We also stopped at a site where several vendors were set up and we got to see each of their wares. There was stunning pottery, pretty jewelry and unique tiles. I ended up buying a pair of silver earrings but could certainly have bought more as the pottery was so very appealing and the prices were very reasonable. At the White House ruins we saw a group of students with matching sweatshirts with “BIKAA ADANI ALNEEH” on them. I asked the videographer about them and he told us they were a group from Cooper High School in Abilene, Texas. The wording on their shirts was in Navajo and translated meant “Gather at the table”. Groups of students have been coming to Chinle for 16 years for a Service project bringing clothes, food, blanket, etc. They have been contacting the elementary students though e-pals and now have gotten a chance to meet them. Although we had discussed leaving today and traveling on to Cortez by the time we got back to the RV it was 1:30, too late to have lunch, disconnect and get on the road for a 150 mile trip so we decided to go without hookups one more night. We had lunch and then rode into Chinle to the grocery store and to gas up the car. On the way back to the campground we stopped at the Visitor’s Center and bought a magnet. Go figure. When we got back to the coach we had to decide what to do with the rest of the afternoon. Since we had not stopped at the White House Overlook yesterday we decided to ride there and boy, are we glad we did. Not only was the view stunning but we chatted with some people that were local to the area. Both of the guys were doctors at the local hospital and were able to tell us a great deal about the area. One of the guys had worked in Africa and he likened Chinle to a third world country. Because of a treaty signed by the Navajo years ago all members of the tribe are promised free medical care. We returned to the coach and I spent the rest of the day working on the blog and trying to secure the best place for us to stay tomorrow night. Jerry had a kink in one of his hoses so he worked on getting that repaired. Dinner was left-overs, then another quiet and dark night! What a day, some good and some not so good. Hoping that we’d be able to get to Chinle to see part of Canyon de Chelly we got an early start but it was still 8:11 when we pulled out. Since we would be without any hookups at Cottonwood Campground we were not sure if we’d able to spend one or two nights. Our early experience with dry camping wasn’t very successful so we wanted to get to Chinle early enough to spend the day sightseeing and then possibly tomorrow morning and then leave for Cortez, Colorado where we’d be in a full hookup site. Everything moved along well, little traffic and good roads. When we left the trading post we decided to get gas before we got on the main highway but we surely chose the wrong station. We got up to the last gas pump with no problem but getting out was a big problem. We backed up, pulled forward, backed up, etc. until Jerry finally said we had to disconnect the car. So we did right there in the middle of the parking lot with cars going by very close to us! I pulled the car over, parked it and then helped direct Jerry until he was able to pull away from the gas pump. He drove over to the side of the lot and we began reconnecting the car. As we were doing that a lady walked over and through conversation we found out that we were parked next to each other last night. Then … she told us we had left our chocks. Dang – never had that happen before. She said she had put them on the picnic table. I told her to take them and if we happen to meet up again we would exchange them. Otherwise, just enjoy them. We drove on into Chinle and pulled into the Visitor’s Center. We got a brochure and they directed us to the campground. Only one other 5th wheel was there when we arrived so we had our choice of places. Although there was a hut at the entrance no one was there and it was self-pay, cash only, so after we got set up and had lunch we stopped there on our way out and left $14 for the night. We’ll see how we do tonight before we commit to another night of 24 degrees! Before we left the coach though – they say that things happen in three’s. Well, our third one happened. Jerry tripped over a charger cord I had plugged into the USB port on the dash. I’ve done it before but apparently not as hard as Jerry did. Yep, now our double USB port is broken. Oh well …. If that’s the worst thing that happens we’ll be happy. As soon as we had lunch we returned to the Visitor’s Center and asked for recommendations for the afternoon activities. Since it was after 1:00 the ranger suggested driving the rims and stopping at the overlooks. He suggested the North Rim first as the setting sun on the South Rim was quite impressive so off we went. 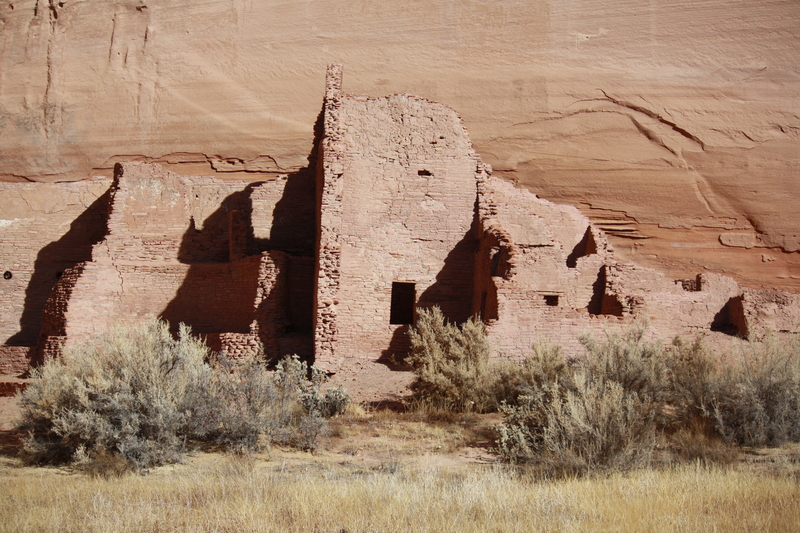 The first overlook was Antelope House Ruin named for a Navajo artist who lived there in the early 1800’s. We are used to just pulling the car up and looking out over a pretty vista. Not so on this trip as we had a little walk. The trail to the overlook was rocky but an easy up and down and short also. The view was spectacular. The drop off was – wow – a long way down. There was a sign warning people to watch their children and pets. Our next stop was Mummy Cave Ruin. As we walked up and were looking around I suddenly saw in the far distance the largest ancestral Puebloan village in the canyon which was occupied until about 1300. It was nothing short of amazing to see the “tiny” little village and to imagine the lives they led. The east and west alcoves were for living and ceremonial rooms. 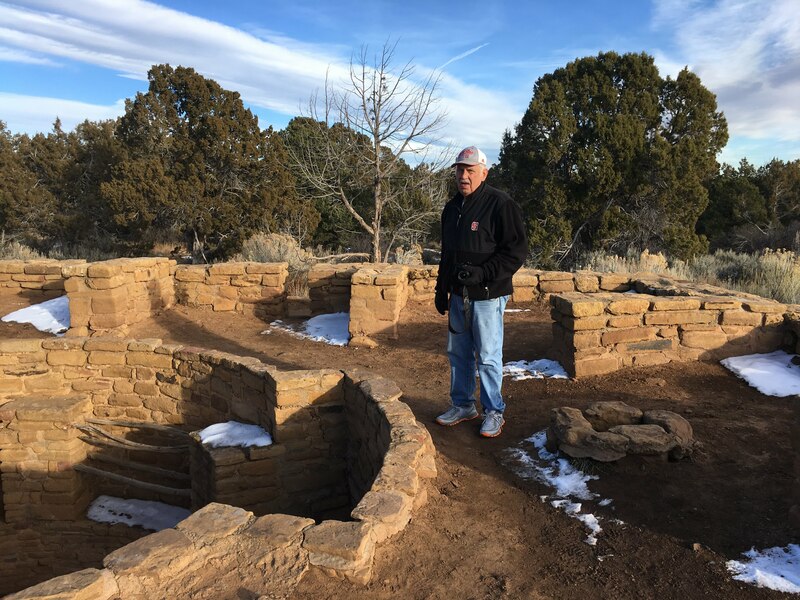 We concluded the North Side by visiting the Massacre Cave where about 115 Navajo were killed by a Spanish military expedition. The Navajo took shelter on the ledge above the canyon floor and when they were discovered they had no way out. The Spanish killed everyone, mostly women and children. Unimaginable. We returned to the Visitor’s Center parking lot and discussed taking a Jeep tour of the canyon in the morning. The tours have been highly recommended so even though it was costly we decided to do it. Jerry called AZ Canyon Tours and they will pick us up at 9:00 at our campsite in the morning. Next we headed out for the South Rim, a 37 mile round trip. We stopped at 6 of the 7 overlooks saving the White House for tomorrow since we want to hike that one. Each one was distinctive in its own way. The second stop was the Tsegi Overlook where we could see that there was farming on the canyon floor. 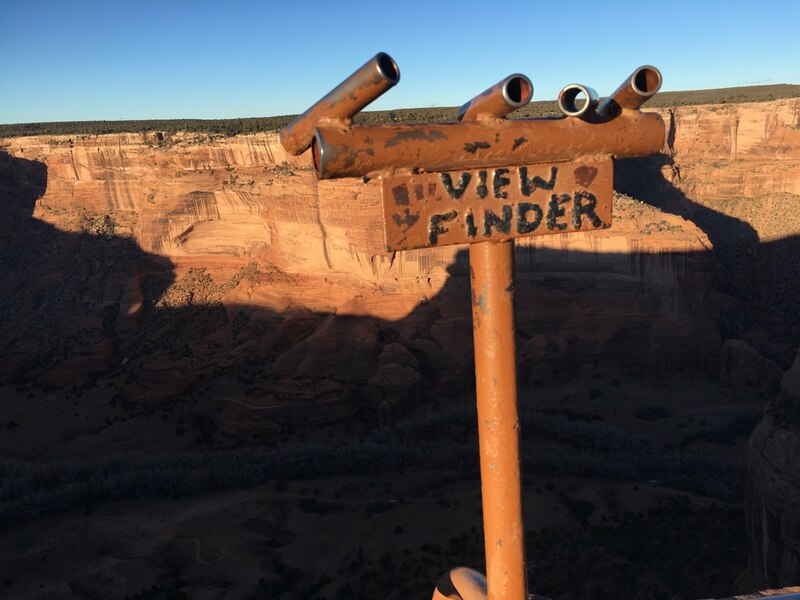 The third overlook, the Junction Overlook has views of Chinle Valley and the confluence of Canyon del Merton and Canyon de Chelly. It was incredibly windy and we were vastly underdressed. We clambered over the rocks for just a short while but were so cold we couldn’t stay long. At the next overlook, Sliding House we continued to clamber over rocks. We had put on coats so we were a bit more prepared. When we stopped at Face Rock they had a view finder there, nothing like I’ve ever seen before but when we peeped through the small tubes we could see specific sights. Our last stop was Spider Rock. Along the highway we had passed snow and ice on the road so we were attentive to our drive plus it was getting later in the afternoon and we were afraid anything on the road would freeze. Spider Rock is amazing. 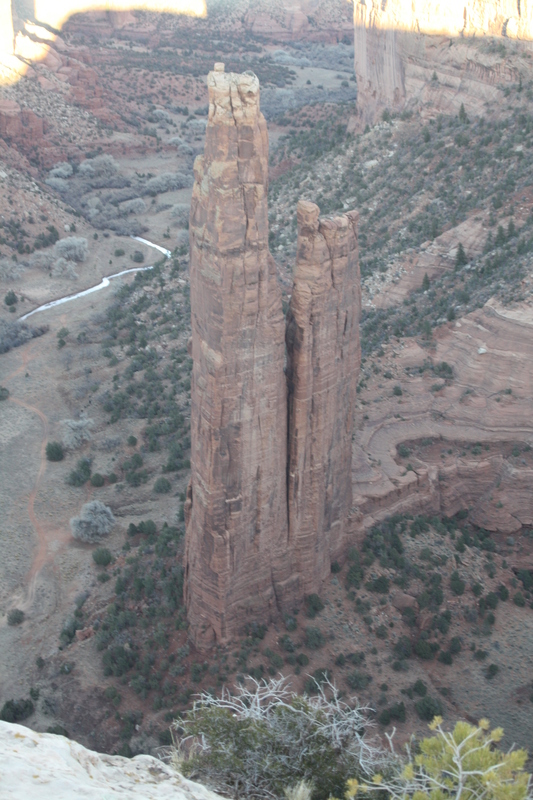 It is an 800 foot sandstone spire that rises from the canyon floor at the junction of Canyon de Chelly and Monument Canyon. When Jerry saw it he remarked that this was the picture that he had seen on Trip Advisor a number of times. The path had icy patches along the way but fortunately hand rails so we got by with no problem. The view was beautiful and watching the canyon change colors as the sun was setting was amazing. God’s handiwork was visible everywhere. 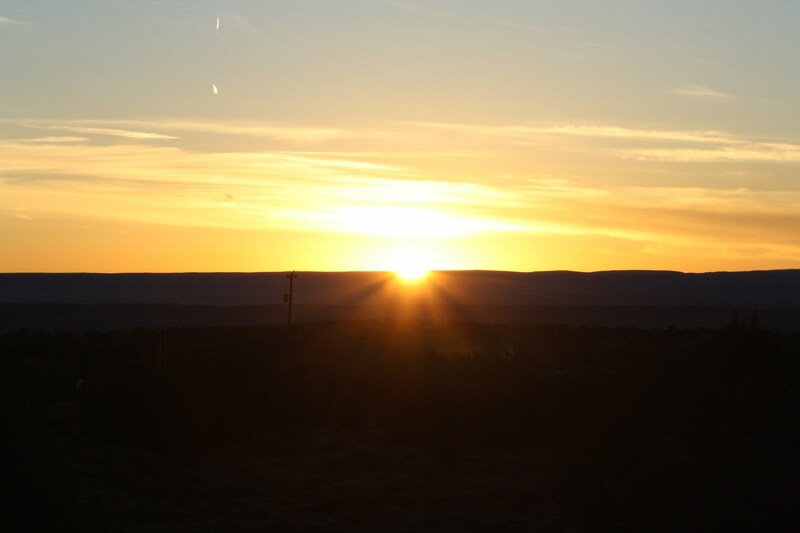 On the way back to the campground we stopped on the road where Jerry got some pictures of the setting sun. When we returned we found that the propane had kept the coach warm and toasty so we turned on the generator to heat up our leftovers, take showers and get ready for bed. Campground rules say all generators must be turned off at 8:30 so it will be a dark night for us. When we returned the one camper that was here earlier was gone so I thought we wouldn’t have to worry about using the generator after hours but wouldn’t you know some tent campers were pulling in and I imagine they don’t want to listen to a generator. Brave people to be tent camping in 24 degrees. Wow! Showers, dinner and a quiet night.